Eva was born on June 11, 1916, in Grouse Creek, Utah to John and Ellen Betteridge. She married Robert Rowland on May 5, 1941, in Ogden. He died March 19, 2005. She worked for the Spa Fitness Center in Ogden for 23 years teaching water aerobics. After retirement, she volunteered for 15 years at Your Community Connection of Ogden. She enjoys watching the Utah Jazz, gardening, sewing, spending time with friends and relatives and occasional visits from her 94-year-old sister, Raida Kimber, of Grouse Creek. She loves children and is called “Grandma” by several children throughout the state. Her children and their spouses are Robert and Patricia Rowland of Beaverton, Ore., and Judy and Victor Leon of Honolulu, Hawaii. 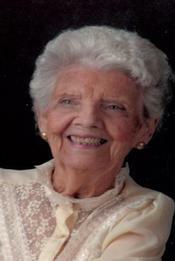 Eva Rowena Rowland, 96, passed away on Friday, October 5, 2012 at the Legacy House Assisted Living Center due to advanced age. She is buried at Lindquist’s Washington Heights Memorial Park in Ogden, UT.